The Volturi are one of the oldest operating vampire covens. Centered in Italy the Volturi take it upon themselves to make sure all vampires around the world abide by the oath to keep their existence a secret. Although the Volturi are only the three rulers and their wives, the members that make up the guard are numerous and just as feared by other vampires. The vampire coven known as the Volturi live in Volterra, Tuscany (Italy). They are regarded as “royalty” by other vampires because they have lived for well over 3000 years and act as police, enforcing the rule that vampires’ existence remain a secret from humans. They often send emissaries or enforcers from Volterra to prevent overzealous covens and renegade vampires from exposing their kind. They are guarded by several powerful vampires who have been recruited for their powers and skills. Carlisle once stayed with the coven as a guest, but left due to his desire to avoid harming humans and established his own coven in the United States. At the end of New Moon, the Volturi discover that Bella, a human, has learned that vampires exist and demand that she become a vampire or else be killed. In Eclipse, they arrive in Forks under the pretense of destroying Victoria and her newborn army for violating Volturi law; their true intentions are to allow Victoria’s army to destroy the Cullens, whom they envy and view as a threat. In Breaking Dawn, the vampire Irina goes to the Volturi and warns them that the Cullens have created an immortal child after seeing Edward and Bella’s daughter, Renesmee, hunting close to the Cullens’ house. The Volturi coven travel to Forks to destroy Renesmee and the other Cullens, but leave when they are outfaced by the group gathered there. The Volturi leaders include Aro, who can read every thought a person has ever had once he has made physical contact, Marcus, who senses relationships, and Caius, who has no known power. Aro’s wife, Sulpicia, Caius’ wife, Athenodora, and formerly Marcus’ wife, Didyme, who had the power to make others happy, also act as leaders. The Volturi guard consists of 32 members, including Jane, who creates illusions of pain; her twin brother Alec, who is able to block others’ senses; Demetri, who can track anyone once he has the tenor of their mind; Chelsea, who can change emotional bondings; and Renata, who can make anyone feel distracted and wandering when they are near her (classified as a “shield”). The majority of the Volturi guard remain nameless throughout the series. There is also a human secretary named Gianna who appears in New Moon. Despite her hopes to become a vampire, she is killed by the Volturi by the events of Breaking Dawn. The Volturi have invited Carlisle, Edward, Alice, Kate, Benjamin, Zafrina, and Bella to join them, though all have refused. 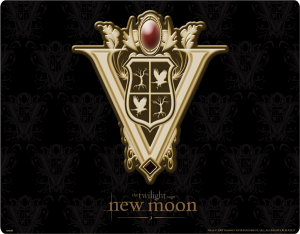 In The Twilight Saga: New Moon, the cast of the Volturi includes Michael Sheen as Aro; Jamie Campbell Bower as Caius; Christopher Heyerdahl as Marcus; Dakota Fanning as Jane; Cameron Bright as Alec; Charlie Bewley as Demetri; Daniel Cudmore as Felix; and Noot Seear as Heidi. Fanning, Bright, Bewley, and Cudmore all reprised their roles in The Twilight Saga: Eclipse.